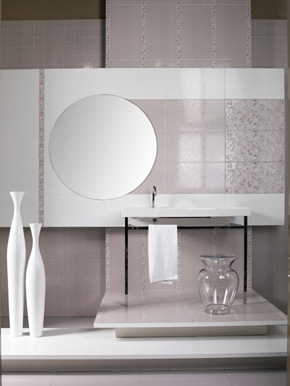 In the spirit of European interior design, wall tile can also be showcased as art in your room. Check out the bedroom below where a very distinctive extra-large 60x60 wall tile (HISPANO AZUL manufacturer, tuareg gris collection) is used from floor to ceiling and stands out in the room like a painting or piece of art would. This design works well with higher-end tile creating a very unique texture and look. In this room (above, right), a combination of wall tiles and wood shelves are used to achieve a very interesting effect. Light-colored ceramic tile is used in combination with smaller, darker brown tiles and accents. Note how the bookshelves are longer than the actual tiles, offering an interesting 3-D perspective rarely found in wall designs. In the background, a darker cream colored wall tile is used from floor to ceiling, making the lighter colored materials in the foreground stand out by contrast. The complexity of the wall tile below (left) is a brain-teaser. The homeowner used a variety of innovative colors, sizes, and borders; even adding a mirror within the structure to achieve a collage effect. Admittedly this type of structure is very complex to put together but worth the effort as it definitely gives your room a distinctive look. Now let’s look at a much simpler design (above, right) and study in geometric patterns! The homeowner used a different combination of tile and paint colors for a very unique look. On the left wall, darker ceramic tile is used with a contrasting beige paint. On the right wall the reverse effect is achieved with a much lighter wall tile used with a floor-to-ceiling dark border that perfectly complements the beige tones used in left wall but with a slightly different dark-brown paint. The wall tiles used in the border are very narrow and small against the larger white tiles to create a dramatic backdrop for the tub. 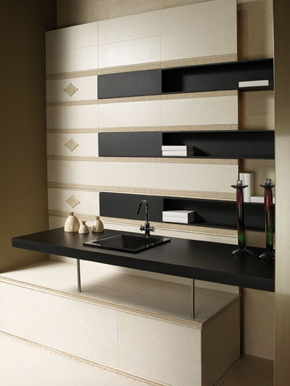 In this design, very large wall tiles are used to cover the whole wall. Sometimes, the tile pattern itself is so unique that you don’t need a fancy design pattern or border to achieve a striking effect.